Sustainable Industries Magazine recently published its fifth consecutive “Top 10 Green Building Products Guide.” Products were judged on four categories: LEED compatibility, environmental performance, value and innovativeness, and design aesthetic. Here is a run-down of the products that made the list for 2010. 1. AQUS Greywater System by Sloan Valve Co. – A small-scale water re-use system that takes bathroom sink greywater, cleans it, and then uses it, along with some freshwater if necessary, to flush the toilet. According to the company, it can save 4,000 to 6,000 gallons of water per year. Not bad for a $400 investment! 2. Acrovyn 4000 by Construction Specialties Inc. – This wall protection product was selected for what it does not contain: no PVC plastic, no PBTs, no BPA, and no halogenated fire retardants. It has been certified Cradle-to-Cradle Silver. 3. Control4 Energy Management System by Control4 Energy – This system, including hardware and software, allows home owners to have better control over their energy use. The five-inch touch screen allows owners to adjust their energy use, as well as sending data to their utility provider assisting with demand response and energy efficiency programs. 4. Energy Efficiency Education Dashboard by QA Graphics – This interface allows a building owner to show real-time energy and water use, green building features, and LEED checklists through an interactive media such as a touchscreen kiosk. This will come in handy for green building owners who want to show how much of a difference they are making. 5. Energy Recovery Ventilator by Building Performance Equipment – These little units save quite a bit of energy on heating and cooling by pre-conditioning incoming outside air using the temperature of the outgoing conditioned air. They simply install in-line with the existing ductwork, and do not require additional structural supports. 6. Second Glass – Broken windshields are repurposed into walls, dividers, shower enclosures, and more. 7. Solatube Daylighting Systems by Solatube International – If you haven’t seen these small-but-powerful skylights, you are missing out! Instead of large-scale windows being installed in the roof, creating structural issues, small domes are installed with an adjustable tube leading down to the ceiling. This allows natural sunlight to travel through attic spaces and even whole floors, and retrofits are a breeze! 8. Strand Poplar Flooring by EcoTimber – Waste from the Chinese furniture and paper industries are cold-pressed into a dense rock that is made into flooring. According to the manufacturer, it is quite durable, as they offer a lifetime warranty. 9. Ultimate Pervious Pavement by Evolution Paving Resources – Pervious pavement reduces stormwater runoff and recharges the groundwater, and can save a project money in sewer costs. Ultimate Pervious Pavement has 18 to 23 percent voids in the structure, allowing stormwater to easily run through. 10. Warmboard by Warmboard Inc. – Anyone who has stepped on a cold tile floor with bare feet will appreciate this product. What makes this hydronic heating system different from the rest is the low water temperature required. Methods such as solar, ground source heat pumps, and fuel cells easily supply the heat needed. 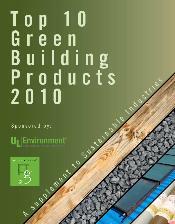 Download a copy of the “Top 10 Green Building Products 2010,” including 3D models of all the products, from Sustainable Industries. Cover courtesy of Sustainable Industries.